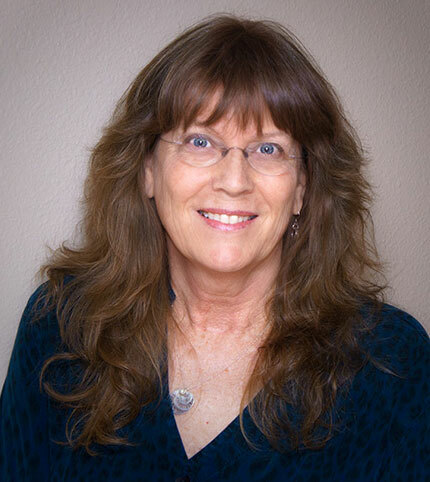 Bonnie Pryor is a Tucson-based jewelry artist who creates handcrafted Sterling silver chain maille jewelry under the name Joya Bonita. She loves jewelry that has a clean, classic style and works to create pieces that embody both a simplicity and elegance of design. Bonnie’s jewelry includes necklaces, bracelets and earrings that are handcrafted from Sterling silver wire into a variety of traditional and contemporary chain maille patterns, also incorporating semi-precious stones and crystals to create unique, one of a kind pieces. She also does custom stamping on sterling silver disks for bracelets or necklaces, providing a personalized touch to commemorate special dates or occasions, such as bridesmaid gifts. 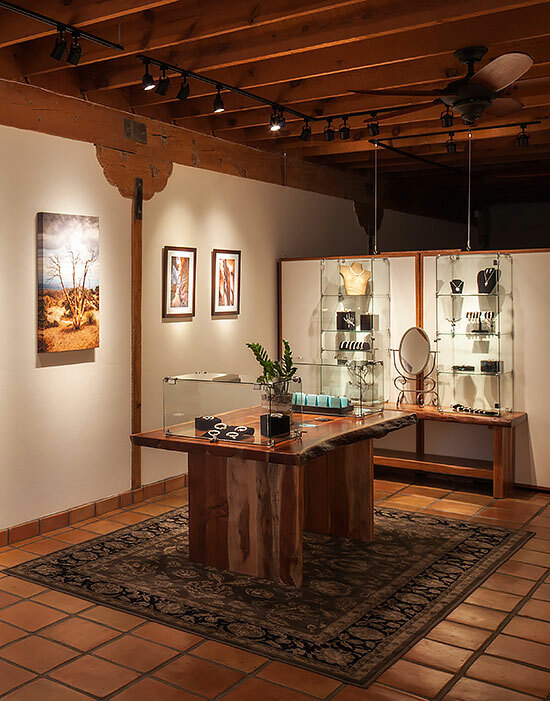 Bonnie and her husband Paul, who is a landscape photographer, own and operate Reflected Light Gallery, located in La Plaza Shoppes on Tucson’s east side. 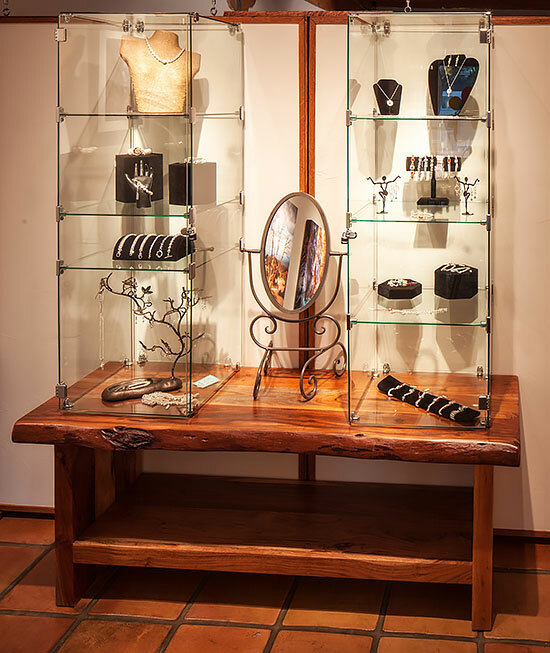 The gallery is home to Bonnie’s handcrafted Sterling silver jewelry, as well as Paul’s large landscape photography prints, and also serves as a working studio for both artists. I have lived in Tucson most of my life. My parents moved here from Illinois in the 1950s when my family bought Johnie’s Restaurants. I grew up on the east side, and have always loved the Sonoran Desert and the wonderful Tucson weather! It’s a dry heat, as they say, and I am always reminded of that when I go back to visit my grandparent’s farm in Illinois in the summertime. I didn’t really get into jewelry making until a little later in life. I started making stained glass when I was in my twenties, and did that for several years. When our kids were grown and out of the house, my husband and I both took up hobbies that we never really had time for while we were raising our kids. He took up photography, and I took up jewelry making. I initially began making jewelry for myself as a hobby, and then as I got better, I started making gifts for family members and friends. I started off making jewelry with wire and beads, learning from both online and locally available classes. 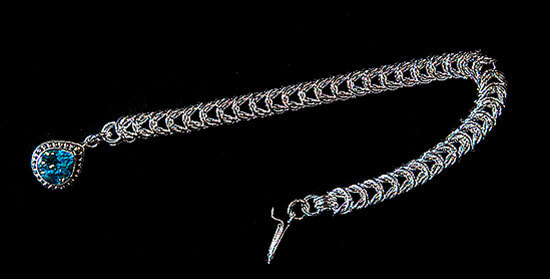 Fairly early on I was introduced to chain maille jewelry, and it quickly became my favorite. I took some classes from a local chain maille artist that I met at the Tucson Gem and Mineral Show that provided me with a foundation, and I have continued on from there. I worked on developing my chain maille skills during evenings and days off, and the focus required for the intricate patterns and fine detailed work was like therapy to me. During that time I also switched from buying the assorted jump rings required for the various chain maille patterns to buying straight Sterling silver wire and making my own jump rings. I did this both to improve on the quality of the individual jump rings, as well as to be able to create rings of the various wire gauges and ring diameters required for a given pattern without having to rely on availability from an outside source. As my jewelry making has progressed, I have continued to take additional classes in other areas of interest, including multiple-day classes in lost wax casting from the Old Pueblo Lapidary Club and silver jewelry fabrication from the Revere Academy in San Francisco. My love of jewelry making fits in well with my love of tools in general. Any opportunity for a trip to Home Depot or Lowes, or to Star Gems or Rio Grande for specialty jewelry making tools, and I am there. Flex shaft systems, stamping machines, assorted specialty jewelry pliers, torches for soldering and enameling, jump ring mandrels, winders and cutting systems; you name it. I am a certified tool fanatic, and that is part of the fun and fascination that I have with jewelry making. One of the reasons that I look forward to the Tucson Gem and Mineral Show is to see what new tools, techniques and classes are available. 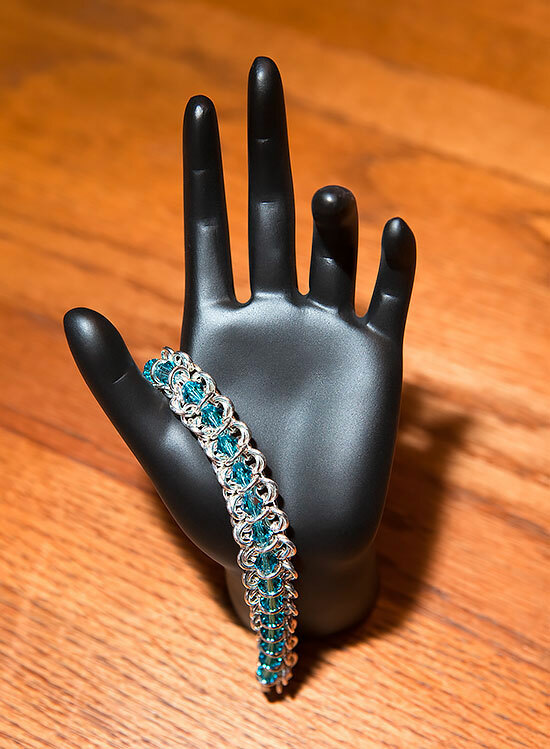 All Joya Bonita chain maille jewelry starts with a piece of straight Sterling silver jewelry, or multiple pieces of wire if rings of different gauges will be required. The wire is hand coiled around a mandrel and the coil is cut to create individual jump rings. The jump rings are then linked together one by one into the desired pattern. 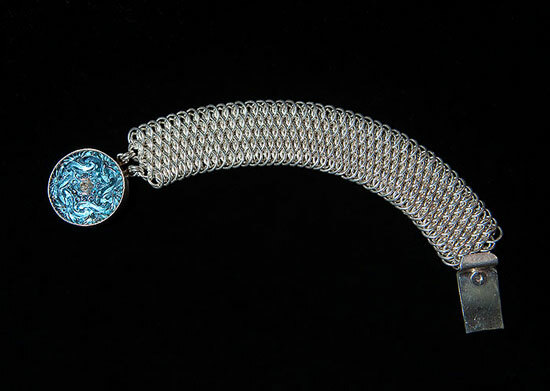 When the pattern is completed to the desired length, a clasp, pendant or ear wire is added to finish the piece, depending on whether it is a bracelet, necklace or earring. Precious or semi-precious gemstones, pearls or crystals are also incorporated into the design. Once the jewelry is completed, it is cleaned and tumbled for hours to create a shiny finish. 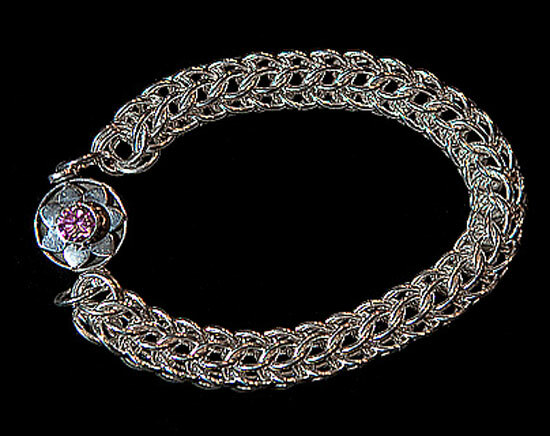 This method of making jewelry is based on ancient chain maille techniques that were originally used to create flexible mesh consisting of small metal rings linked together in a close pattern to create a material used for armour garments such as hauberks, chausses, coifs and mitons. The Celts are commonly credited with inventing chain maille, but the earliest known examples are Etruscan, dating back to the 4th century B.C. My husband Paul and I love to travel throughout the western U.S., visiting family in Nevada, California, Washington and Montana, and visiting lots of national parks and monuments along the way. At each stop along the way, he is taking lots of photographs and I am making jewelry. Before we go on a trip, I will make the jump rings required for several jewelry pieces, and put them into plastic film canisters, which I throw in my daypack along with two pairs of jeweler’s pliers and a magnifier. When the light is right and the camera comes out, I know that he will be shooting for a while, so I sit down on a rock, open up my pack, and start making jewelry. He is always teasing me saying that those pieces of jewelry should have special tags identifying which state park, national park, or other scenic location they were made in. In addition to my love of spending time with family and making jewelry, I love to read. I particularly enjoy historical fiction regarding life as it was several centuries ago. 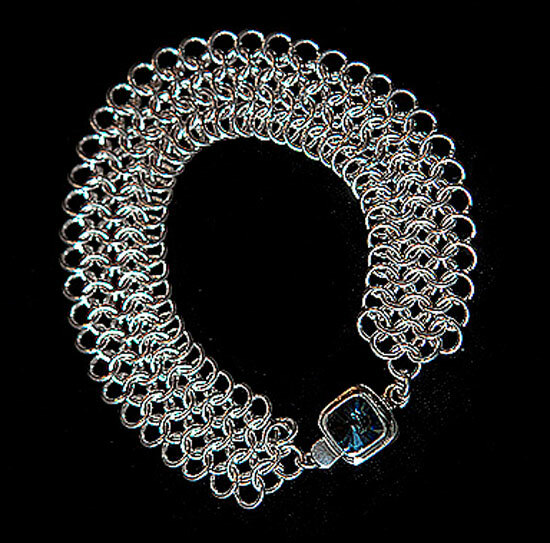 I think that one of the reasons that I enjoy making chain maille so much is that it is also a link to the past when things were handcrafted by skilled artisans, and it is satisfying to be able to participate and help to keep alive a time-honored craft that was originally developed over two thousand years ago.